Discover Potosí during your price guaranteed Bolivia vacation. 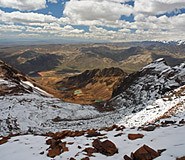 All of our Bolivia tours have daily departures and are fully customizable. 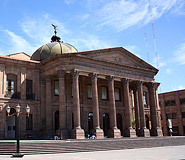 Potosí was founded in 1546, following the discovery of silver in the nearby mountain Cerro Rico, literally “the rich mountain”, which dominates the city. During its mining heydays in the 17th century, Potosí was the biggest and wealthiest city in the Americas. Silver from Potosí was taken to Spain and used all over Europe. Now a walk through the streets offers an interesting glimpse back to the city’s golden age. Declared a UNESCO World Heritage site in 1987, this city is full of past splendors, including ornate churches, monuments, and colonial architecture. 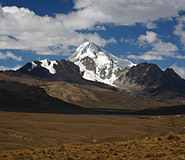 Set at an altitude of 13,420 feet above sea level (4,090 meters), Potosí is among the highest cities in the world. Although the mining activity has been slowly declining since the 19th century, Cerro Rico continues to be mined for silver even today. City tour. We highly recommend a visit to the The Royal House of Mint (Casa de la Moneda de Bolivia; the center of coin production in colonial times and one of the greatest testaments to greed in Latin American history). A simple stroll around town to admire colonial architecture is another pleasurable activity; be sure to stop by the main Cathedral (to admire its intricate interior), the Iglesia de San Lorenzo (for its classic mestizo facade), and the Museo & Convento de San Francisco (for lovely rooftop views). Visit the silver mines. Silver is what created this city, and it would be shame to leave without learning more about the work conditions of Potosí’s mineral extracting activity. There are hundreds of cooperative mines in and around Potosí and several of them offer guided tours. These silver mine tours are not for the faint of heart, as they often require crawling through small tunnels and climbing up ancient ladders, but the insight into the difficult working conditions and realities of a miner’s life is eye opening. Soak in some hot springs. Relax in the Tarapaya hot springs, located about 40 minutes outside of the city. You can visit the natural Laguna Tarapaya (also known as the Ojo del Inca, or Inca’s Eye), which is an outdoor crater lake nearly 165 feet (50 meters) wide, or select to soak at the hot spring resort of Balneario Tarapaya, a private facility with rooms that pipe in naturally-heated water. Potosí is a high altitude city, resting at a height of 13,420 feet above sea level (4,090 meters). Weather here tends to be cool with almost freezing rain, so pack accordingly regardless of when you visit!